Mars sure is popular! There are currently five active Mars missions, including Curiosity, and soon there will be another — India’s adorably named MOM (Mars Orbiter Mission). So far, only three entities have gotten a close-up glimpse at the Red Planet: the U.S., ESA, and USSR. 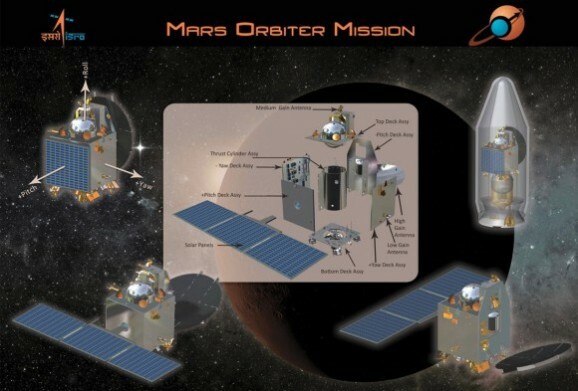 Russia’s 2011 Fobos-Grunt mission was intended to collect a sample from Mars’ moon Phobos, and to put a Chinese probe in orbit around Mars. The mission failed shortly after launch, but the Russian Federal Space agency plans to send a rover in 2018. If India’s $69 million Mars mission succeeds, it will get to Mars long before then — likely this year, and perhaps later this month. MOM’s main goal is to search for Martian methane signatures, which could emit from sources that either living or non-living. On Earth, methane, the second most common greenhouse gas, comes from livestock, leaks in natural gas systems, and wetlands. The nearly 3000-pound MOM orbiter, called “Mangalyaan,” could launch as soon as October 28th from the Polar Satellite Launch Vehicle in Srihanikota, India. The orbiter will carry instruments such as a multi-color imaging camera; a methane gas sniffer (that one’s got the bum job, eh? 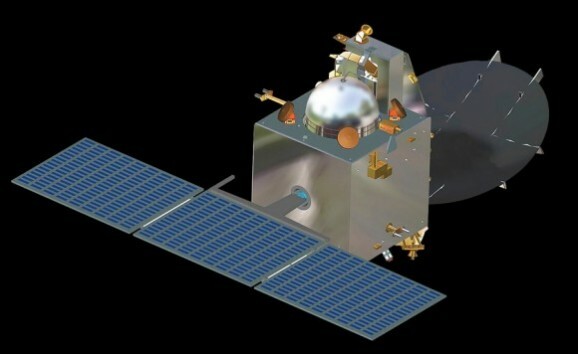 ); an alpha photometer that measures Mars’ water loss, as well as its levels of hydrogen and deuterium (a valuable heavy isotope of hydrogen that Mars has in abundance); a thermal imaging spectrometer that can map Mars’ surface; and a mass spectrometer that will analyze Mars’ atmosphere. Scientists will be able to compare MOM’s methane measurements to those gathered by Curiosity, which detected virtually no ground-level methane, which was surprising given previous indications of the gas. When Europe sends its ExoMars Trace Gas Orbiter to the Red Planet in 2016, scientists will have a third data set for comparison. 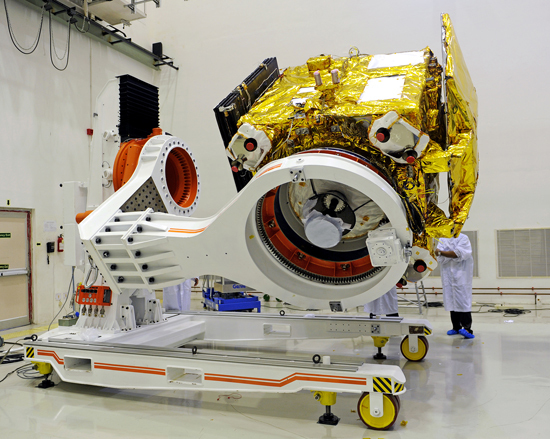 Mangalyaan is currently completing its last pre-launch test, although the exact launch date largely depends on Mother Nature. There’s been some funky weather in the South Pacific lately, including Tropical Cyclone Phaillin, that could delay liftoff. The launch window runs from October 28th – November 19th. MOM will first enter orbit around Earth before starting its trajectory toward Mars roughly a month later. MOM will cruise for roughly 300 days, and then the most crucial part of the mission, the orbital insertion engine, will fire and launch MOM into orbit around Mars in September 2014. The MOM mission will conduct its Martian measurements for six to ten months. September 2014 is also when NASA’s MAVEN mission is scheduled to reach Mars orbit. NASA will be providing support to MOM via NASA’s Deep Space Network, a international trio of deep-space facilities that relay information for space missions. A successful mission will garner valuable information about Mars’ methane levels, which may provide additional insight about the presence of microbial life on Mars. It will also prove that the India Space Research Organization has the chops to execute a mission to Mars and will pave the wave for future explorations on the Red Planet. I can’t help but wonder if another space race is shaping up — this time to see who can get a human on the Red Planet first. For those who are wondering why a third world country like India is aspiring to reach outer space when nearly 70% are receiving food subsidy, the answer is simply put by one of the Indian scientist. The nation cannot wait to develop advance science and technologies for the next twenty years which is the time frame for lifting the Indian masses out of poverty.